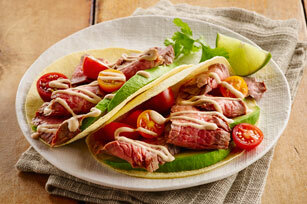 Switch up your regular taco recipe with these easy-to-make beef tacos. The ranch dressing is mixed with hot sauce to provide all the flavouring you need for the grilled steak, fresh tomato and avocado filling. Try these tacos tonight. They're sure to become a new family favourite! Score steak on both sides with shallow cross-cuts. Mix dressing and hot sauce. Remove 2 Tbsp. dressing mixture; brush onto steak. Grill 6 to 8 min. on each side or until medium doneness. Cut steak across the grain into thin slices. Top tortillas with meat, tomatoes, avocados and remaining dressing mixture.